Want to connect to your favorite Ponyville server directly from the TF2 title screen? If you have a reserved slot on the server, this will also allow you to connect automatically without having to enter the console. NOTE: This may break whenever there is a major TF2 update. If that happens, check back to this thread to see if Raini has posted an updated version. Extract the contents of this .rar to your desktop. It should appear as a folder called "tf". Drag the "tf" folder from your desktop to this folder. Windows will ask if you wish to merge these folders. Click "yes". Windows will ask if you wish to overwrite or replace the GameMenu.res and MainMenuOverride.res files. Click yes or "move and replace". Now you're done! 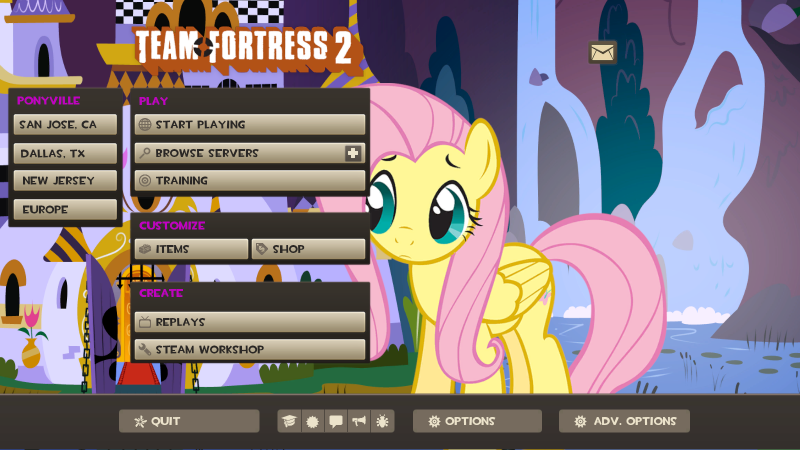 Restart Team Fortress 2 and you should see three buttons for all of the Ponyville.net TF2 servers. Not sure about anyone else but the latest update has broken game menu. I fixed it as best as I could. Replace the old file and it will show the Dallas and San Jose server properly again. As well as the Steam Workshop button. Added a screenshot of what it looks like now. 1650x1080. Not sure how to space them out further without blocking other buttons. I updated the GameMenu.res following the latest TF2 update. There are also two different menu files now: one with buttons for San Jose + Jersey, and one for San Jose + Dallas. Keep in mind that you can only use one GameMenu.res file. FlutterDash recently made an improved version of the game menu that includes horizontal buttons for all three Ponyville servers. I've uploaded it along with a ReadMe file explaining how to install everything. Download it here. 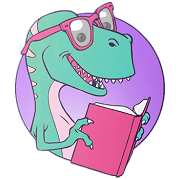 This new version includes a modified GameMenu.res and MainMenuOverride.res. Anyway, this new feature is neat! It really gets rid of my "Promotional Codes" button. did this break for anyone else on the most recent update? The buttons got moved and san jose are dallas are clickable, but new jersey is hidden behind the replay button...i think. mine still works. you may just have to reinstall it. Whenever there is a major TF2 update it could overwrite these files. Just download and install them again. send me a pm and i'll see if i can help ya out. Say, any plans on adding a button for the EU server? It's always empty after all and perhaps a lack of a button is the reason for that. the one currently for download should have the euro server on it. The menu has been updated to include the Euro server and also work with the Christmas update. Thanks to FlutterDash for dramatically improving the layout of the menu for us and keeping it updated! a quick note about the current setup of the buttons. they are customized to be played in a widescreen aspect ratio, 16:9 or 16:10.
nothing i can do to get them to show up if they look like the above image(that i know of) which is a 4:3 ratio. Can't you release a separate version? no idea what a crt is, but i did reply to ur pm. i have an older version of it still. however, that one doesn't have the european server on it. You know, before flat screen? I have the same "Button Off Screen" issue with my laptop, but if it's just the aspect ratio thing, then it might not be a serious thing to me. Actually, it was never serious, I just had to memorize which buttons were which.